I tried breaking down the components and the reasons why they are present on the board. Current component values are not correct. First thing that confused me was R1 and R2, because it seems to me that fuse should be in series with everything that comes after the power supply, so in case of malfunction it pops and divides the power source from the rest of the circuit. Is there any reason why it is put in parallel? Do resistors create open circuit or a short when they burn, or can it be both? Next question is regarding input stage of the chip: I gathered from the datasheet that there is one input capacitor, to smooth out current spikes from power source and protect the chip, however, what is the purpose of C2 and C3? I found online that it could be to filter out low/high frequency noise, but is it applicable if the source is DC? Regarding output stage, I wanted to know if the potentiometer is in the feedback loop to adjust the phase compensation for output? Also, and this is the last question, why are there 3 output capacitors? I understand that C5 would be smoothing capacitor to reduce ripple voltage, but what would C6 and C7 serve? Do these have something to do with noise from switching in the chip itself? Any explanations or directions to useful materials would be appreciated! Is the LED two or three terminal? You have both a red and green arrow indicating the light output, and it would make sense if the green side of a bicolor LED were connected from R2 to ground, and the red from R1 to R2, then the LED indication would change from red to green if the fuse blew. Resistors are available as fusible type, which will fail predictably under overload conditions to an open state. C1 and C2 are likely split into two for either or both packaging reasons compared to a single larger cap, and because the ESR and inductance of the two is likely better than a single one, so it'll be more effective at dealing with the ripple. That's the reasoning behind C6 too - the smaller cap has a lower inductance, so will be effective at higher frequencies where the larger one is beginning to be less so. C5/C6 and L2 form a pi filter to reduce the noise presented at the output. The variable resistor is part of the feedback to allow the output voltage to be tuned, section 9.2.2 of the datasheet explains this. Not the answer you're looking for? Browse other questions tagged dc buck or ask your own question. 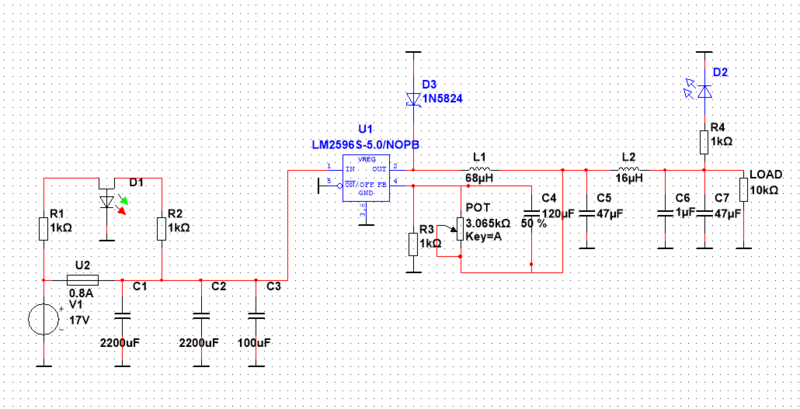 Why my buck converter is not performing well?